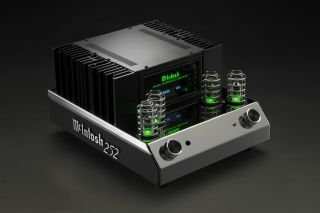 McIntosh launches MA252, its first hybrid integrated amplifier | What Hi-Fi? Taking “retro design cues” from the brand’s MC275 valve amplifier, the MA252 combines valve and circuit technologies. The MA252’s preamplifier stage houses two 12AX7a and two 12AT7 valves inside protective cages, while the solid-state output stage delivers 100 or 160 watts-per-channel into 8 ohms or 4 ohms respectively. The MA252 is McIntosh’s first valve product to include its patented Power Guard technology, designed to monitor and adjust output and input signals in real time to prevent distortion. As you'd expect for a valve amplifier, the MA252 features heatsinks, which are connected to output transistors that aim to reduce warm-up time when the amplifier is first powered on. As it's a purely analogue device, the MA252’s rear panel features two unbalanced, a single balanced and a phono input alongside a subwoofer output. Around the front of the stainless steel chassis is an OLED display, which indicates input selection, bass, treble, tone bypass, balance and input offset levels. All of these can be controlled via the front panel knobs or supplied remote. The MA252 costs £4,500 and can be pre-ordered now, with shipping expected to begin in the UK in December. December 2017 issue now on sale!